The primary purpose of any slide library is to provide a single, central storage location so users always have access to the most current, up-to-date versions of their organization’s presentations. But what happens when a user downloads a presentation? A week, a month, a year later that presentation could still be on their desktop. Is it still current? Have any of the slides in the library been updated since they were downloaded? How would the user know? Well now, with SlideSource’s new vCheck feature, users can always present with confidence, knowing every slide in their offline presentations is up to date. vCheck, short for “version check,” inserts an indicator just above or below every slide in every presentation downloaded from your library. A quick look at the vCheck indicator confirms if a slide is up to date or if it needs to be updated. 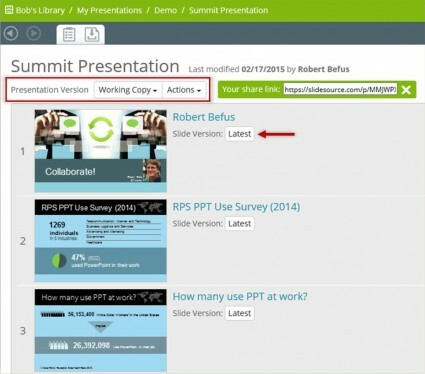 Users can also get access to a complete status summary for the entire presentation and can download the updated version of the presentation from SlideSource with a single click. With vCheck, users will never wonder if their presentation is old and stale. vCheck keeps all of your downloaded presentations fresh and up to date. Click here for more details about how vCheck works and for complete instructions so you can begin using it right away. “Every Slide Counts” isn’t just a marketing slogan for us. Our goal is to make the process of managing your PowerPoint slide and presentation content as easy and efficient as possible… so you can squeeze every bit of value from these important assets. This means we never stop looking for ways to make SlideSource.com even better. Recently, we released a number of new and improved features that do exactly that. Each of these new features were specifically requested by users within the last six months. The first new feature we’ll look at is the Duplicate Slide Search Function. One of the advantages of using SlideSource.com is that you only need one copy of any given slide in your slide library. That slide can then be used across multiple presentations within SlideSource.com. This means you only need to update one slide… in one place (the slide library) to automatically update all the presentations that contain it. Without SlideSource, you would need to track down the slide in each individual presentation on your hard drive, your colleagues’ hard drives, and your company’s server in order to open and update each one manually. 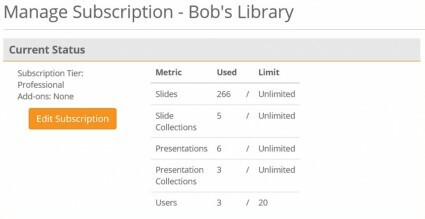 When customers started loading all of their presentation content into SlideSource, they found that they had many copies of the same slide uploaded because they were duplicated in presentation after presentation. 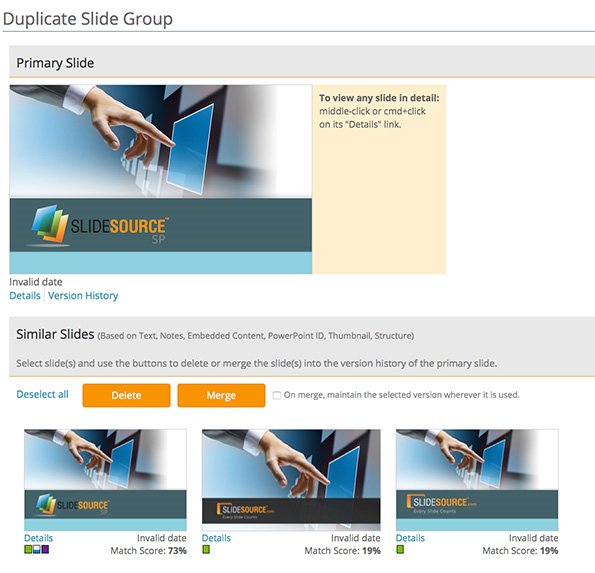 The good news is SlideSource.com users can now easily track down and eliminate all of the duplicate versions they have accumulated and replace the versions they don’t want with the version they do want in every presentation it appears in. Here’s what the process looks like. Step 1: Select your search criteria and designate a Primary Slide. Step 2: Review duplicates and either ignore them, delete them or merge them into the version that you designated to be the Primary Slide. De-duplicating your slides makes you and your team more efficient and this new feature makes the process as simple, quick, and easy as our users have come to expect from SlideSource. If you aren’t already a SlideSource.com user, now is a great time to sign up for a free account and give it a try. The free subscription has all of the features and capabilities of the paid subscription levels so you will be able to see exactly what makes SlideSource.com the most innovative and useful presentation management system available. If you are already a subscriber, be sure to give this new feature a try soon. And in either case, please don’t hesitate to contact us with any questions. 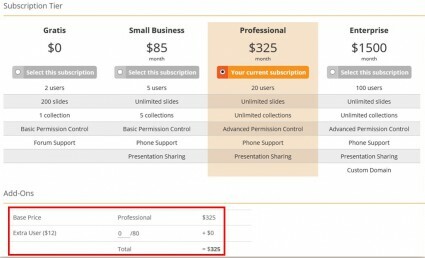 Managing your subscription is easy in SlideSource.com. From the free account to enterprise level service, there is an option that is just right for you. This post covers information on modifying your subscription level and the number of users. Even if you are using the free subscription and just want to add a few additional users, you can do that by managing your subscription. 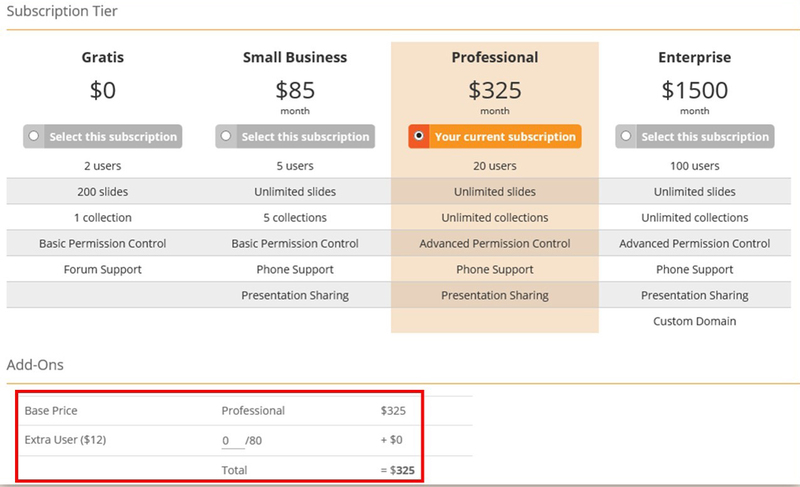 SlideSource subscription levels provide different numbers of Slide Collections and users, however additional users can be added at any time. To manage your subscription, choose the Manage Library option from your Library Home Page. At the bottom of your library settings you will see the option to manage your subscription. Here you will see your current subscription tier and all the specifics of your subscription including the number of users you have authorized to use your Library. To change your subscription settings, use the Edit Subscription button. On the next screen you will be able to change your subscription tier or simply add some users to your current tier. 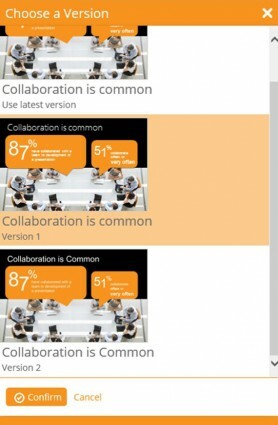 One of the central tenants of productive presentation collaboration is effective version control. 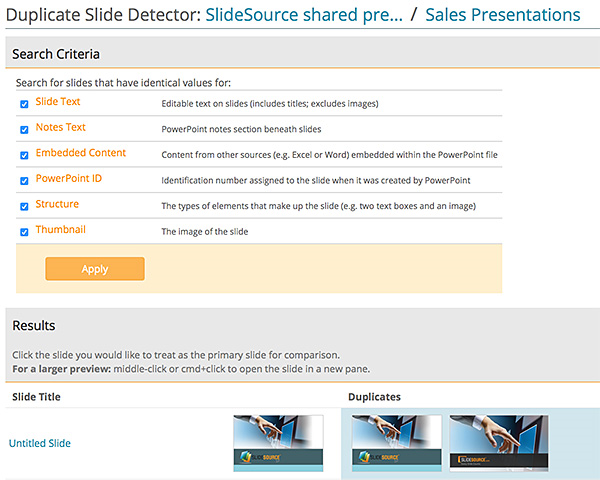 SlideSource.com supports version control of individual slides as well as version control of your presentations. This SlideSource Pointer highlights how to manage your presentation versions. When you create a presentation and drag slides from your Slide Library to it, what you are doing is creating a working copy of your presentation. This working copy is automatically updated as the individual slides are updated. There are times, however, when you will want to save or lock a specific version of the presentation. When you save a version of your presentation that version will no longer be automatically updated if your slides continue to change. You might save a version to be presented to a specific audience or a version you reviewed at a meeting with senior management. When building a presentation in SlideSource, the default mode is to always include the latest version of the slides in the presentation. By using the default mode, the working copy of your presentation will always show the most recent copy of any slides you have added to it. This means that as you continue to edit the individual slides, your presentation is always up to date. There are times when you may want to choose a previous version of a slide to include in a presentation instead of the most current version. To do this, just click on the Slide Version button and choose the version you want to use for the presentation. In the image to the left, version 1 of the slide is selected to be included in the presentation. This slide will no longer be updated in the Working Copy of this presentation, even if the slide is edited in your Slide Library. Usually, you will want your Working Copy to always reflect the current version, and then save versions of the presentation as a whole to lock in slide versions. 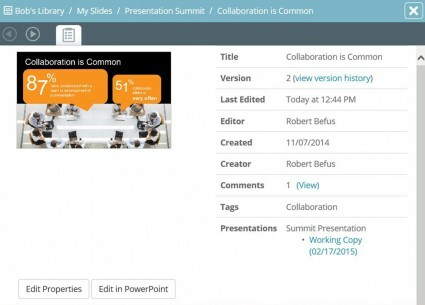 The slide and presentation versioning features in SlideSource.com provide many options for keeping you in control as you develop and collaborate on your presentations. We believe your presentation content is a valuable asset. In other words, we think every slide really does count. Slides have a lifecycle. They are created, edited, used in a presentation, modified and used in other presentations, and eventually they are retired or replaced. SlideSource was developed to help you manage this lifecycle. At the heart of this lifecycle management is version control of both individual slides, of presentations themselves and the specific versions of slides used in different presentations. This may sound complex, but SlideSource makes it all pretty easy. Slide versioning is accessed through the slide properties page. As you see below, the current version number is shown along with a link to the version history page. Notice that at the bottom you will see what presentations this current version of the slide is used in (click image to enlarge). Click on the “view version history” link to see a thumbnail of the different versions of the slide available. In this case there are only two versions of this slide. By clicking on either version you will see the properties page for that version including a list of any presentations that particular version of the slide is used in. You are also able to post comments about any version of your slides. Comments can be used to indicate what has changed on a specific version, or to suggest changes you would like to have made to a slide. Below is an example of a comment on a version. 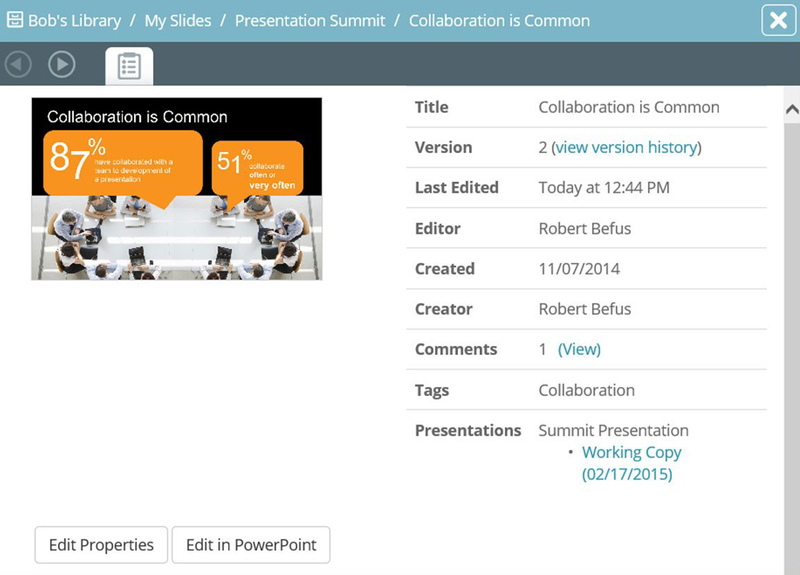 Comments are a helpful way to collaborate and communicate on slide development. In an upcoming SlideSource Pointer email, we will focus specifically on presentation versioning and the options to choose specific versions of slides in presentations as well as how to lock or save certain versions while still maintaining access to a Working Copy that can be used for further editing.